Block of the Month - 8 1/2" x 8 1/2"
This appliqué clown fish block is made out of bright batik fabrics. 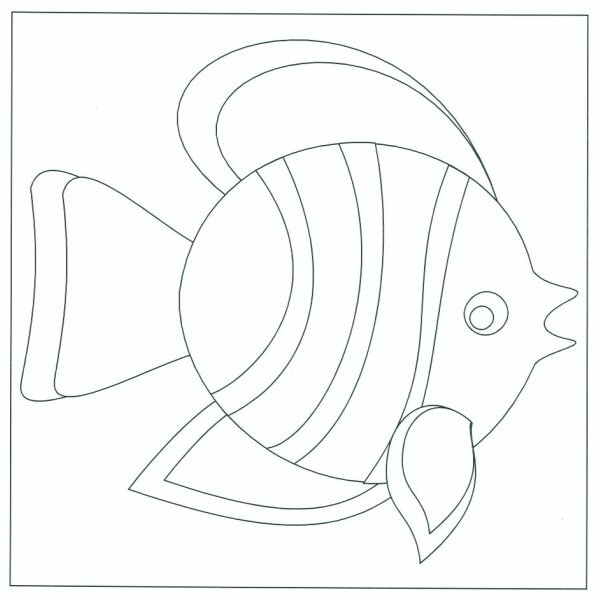 I have designed the fish to resemble Nemo just in case the eventual owner has a soft spot for Nemo. The backing fabric is blue batik to resemble water. Feel free to use your artistic license with this block. You may want to omit the stripes or even have the fins in a single color. It doesn't matter which way he is facing or even if you have him swimming up or down! You choose. For those of you keen to do more on your block like adding another smaller fish or, some kelp or rocks, then please do. 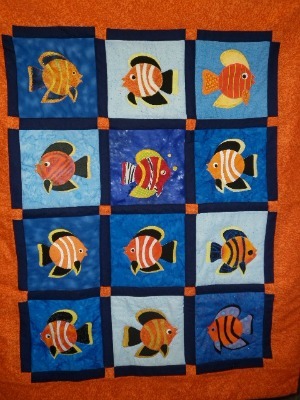 The quilt above was made by the winner of all the fish blocks at our quilting group 2012. It is the first quilt that she has made so a very impressive job! Of course she can now see all the wee adjustments she needs to make next time round. It took her a year to put all the blocks together. Hopefully her next quilt wont take that long. I love the way there just happened to be enough blocks for her to use and the placement of them. It's always interesting to see how a BOM turns out when sewn by 12 different quilters. Half the fish are facing in the opposite direction. Perfect! Feel free to use this block with your group or just for yourself. I'm happy for you to alter any part of the block as you deem necessary. The instructions my group were given are above the fish template. The size of the block background is in the title - also included in the hand out to my group.